This article is about the local government district in south Warwickshire. For the town, see Stratford-upon-Avon. For other uses of the name, see Stratford (disambiguation). 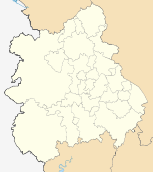 Stratford-on-Avon is a local government district of southern Warwickshire in England. The district is named "Stratford-on-Avon" to distinguish it from its main town of Stratford-upon-Avon where the district council is based. The district was formed on 1 April 1974 by the merger of the borough of Stratford-upon-Avon, Alcester Rural District, Shipston-on-Stour Rural District, Southam Rural District and a majority of Stratford-upon-Avon Rural District. In the state sector, children start school in the school year (1 September to 31 August) in which they turn five. They stay at primary school for seven years until they are eleven. As part of Warwickshire, Stratford-on-Avon still maintains the grammar school system. In the final year of primary school, children are given the opportunity of sitting the eleven plus exam in order to compete for a place at one of the grammar schools. The grammar schools in the district are King Edward VI, Stratford-upon-Avon Grammar School for Girls and Alcester Grammar. The area gets the best GCSE results overall in Warwickshire. Elections to the district council are held in three out of every four years, with one third of the 53 seats on the council being elected at each election. The Conservative party has controlled the council for most of the time since the first election in 1973, and recently has had a majority since the 2003 election. As a result of the last election in 2010 the Conservatives had 30 councillors, compared to 20 Liberal Democrats and 3 independents. ^ "Stratford-On-Avon". BBC News Online. 19 April 2009. Retrieved 3 March 2011.